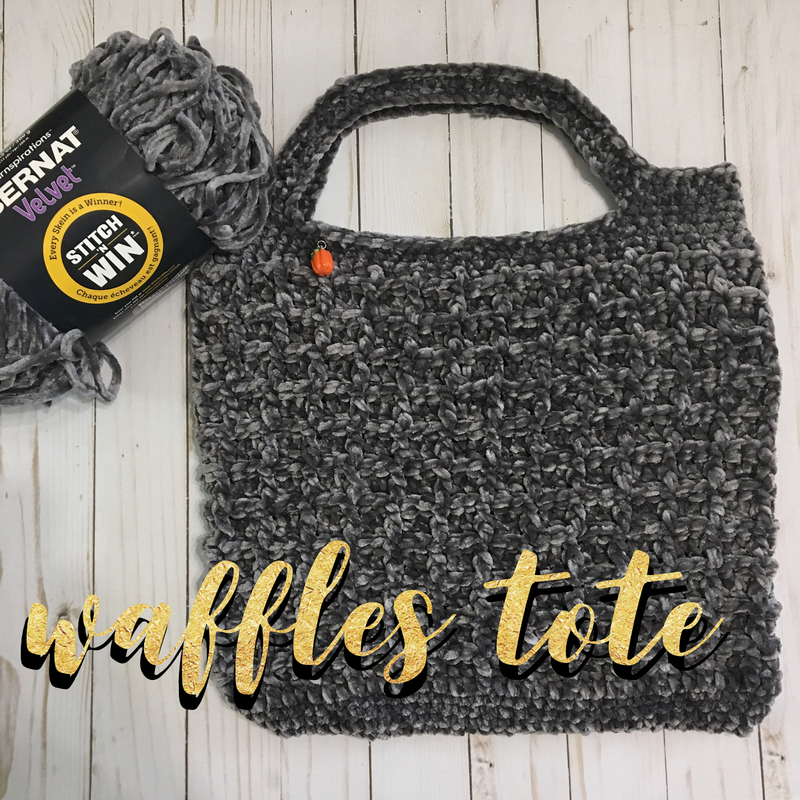 I designed a new bag after seeing the new chenille yarn arriving at Michaels and Hobby Lobby. Its soft, smooth and bulky weight so it works up fast. It slips across a hook in the most satisfying way. I just cannot get enough projects in mind for what to do with it all. 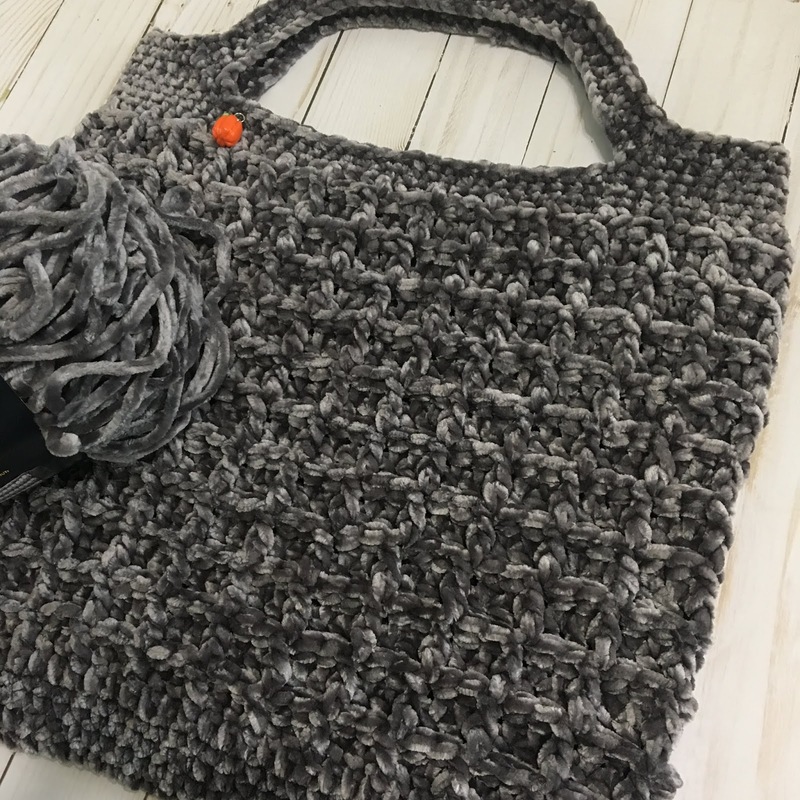 I love this gray color…I used Vapor Gray in the Bernat Velvet yarn. This entire bag also took just one ball of the yarn…always a plus in my book. I hope that you enjoy and thanks for stopping by! Add to your Ravelry here! or Download PDF Here! coming. I really do appreciate it! Finished Size: 17 ½ “ tall x 15” wide. (44cm x 38cm) Lots of negative ease since its stretchy. Yarn Needle To weave in bulky size ends. I LOVE these for bulky yarn. There is a video of how to make this bag here. I find that I get added (undesirable) bulk in my seam from doing so. a lot of stretch and the chains work out too tightly and might pucker the edge of your work. it above the following stitch or your waffle pattern will spiral. Feel free to contact me with any questions. Thanks!! the rest of the pattern. your Ch. SC into the next 35 Ch and in the last Ch SC 2 times, PM in the 2nd of these SC. Slip Stich. Fasten Off. Lay bag flat. From each side count in and PM 9th stitch. Flip bag and repeat. will each have 21 unmarked stitches. of the unmarked side stitches. Sc into stitch after 4th marker and across to the end of row. Ch stitches (handles…you will be IncSC in these markers). Repeat row 33, Fasten off. blog is ALWAYS appreciated. Happy making and Thank you for coming. I really do appreciate it! I am an Amazon affiliate. This post contains links and if you click on them I may be compensated. Thank you in advance! I love size and texture of this bag. Thanks so much for sharing your pattern. Thank you so much, Wendy. Sorry it took so long to reply. I am moving from Blogger over to WordPress and its a challenge. I just found the comment section! 😀 *cheer* I hope you had a nice holiday season.